I don’t really have an excuse for the lack of blogging the past 8 months. There were a lot of things going on these past 8 months with school and work (I switched jobs), etc that needed my focus. I missed blogging and they are many recipes that need to be shared and stories to be told. I enjoyed having a creative outlet and I miss it but I’m not sure Glorious Greens will be the same. I only blogged for about 5 months before my long break so I’m not sure yet what it will be. One of the many reasons that I think, rather that I know this little blog of mine will start to change is that in a matter of weeks (5 wks until the official due date) I’ll be starting a new chapter, life as a mom. I apologize for the awful quality but it is the most recent photo that I have with me, when the urge to blog struck. I’m so excited (and terrified) to begin this new journey with EJ and I can’t wait to meet Baby J. I can’t find the right words to describe how I feel when I stand in the middle of our nursery and think of what lies ahead, there just aren’t words. The blog will most definitely include posts about stepping into this new role, motherhood, babies, etc. I would like to start including homemade baby food recipes once Baby J is ready for solids. I will continue to post recipes and stories, but perhaps I’ll be more selective and forget about the posts just to post. 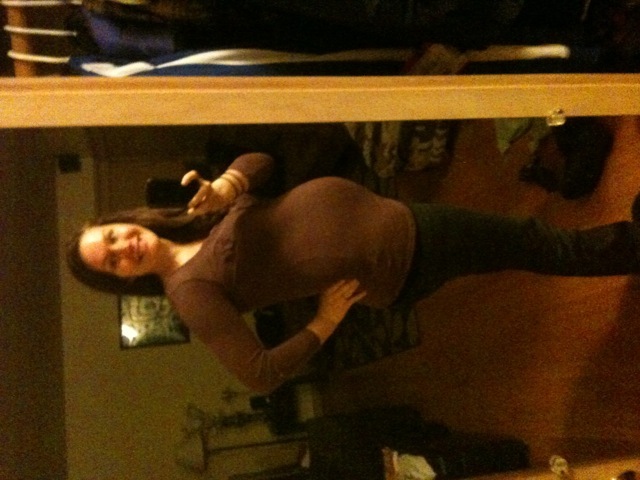 This entry was posted in baby, pregnant by gloriousgreens. Bookmark the permalink. yes!!! welcome back to the wordpress world 🙂 i’ve missed glorious greens!! by the way, you look amazing! I love your smile and I miss your belly. Don’t mind my awkward belly rubbing and touching next Wednesday. It’s best just to ignore me. Hello! I’ll never mind the belly rubbing! I can’t wait to see you. I have been thinking about you and your blog lately. I’ve missed reading your blogs about your creativity and healthy lifestyle. I’m so glad that you enjoy using this as an outlet and I am so excited for you to become a new mom!!! !